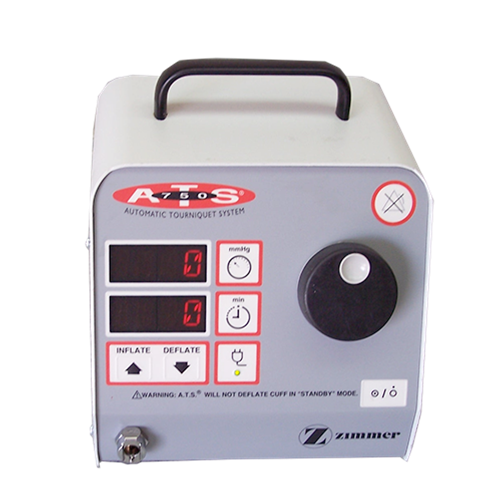 The Zimmer ATS 750 Automatic Tourniquet is a lightweight unit and very user-friendly. It uses ambient air instead of using nitrogen tanks. The microprocessor controls provide accuracy and speed. The ATS 750 can be used on the countertop or with a pole mount. Controls: On/Standby switch, pressure switch, time switch, cuff inflate and alarm silence switch. Display: Pressure - Red 14 segment light emitting diodes (LED), Time - Red 14 segment LED, AC Indicator light - Green LED.